To create the new watermain route within existing road allowances southerly along Keele Street, Tangiers Road, Ceramic Road, St Regis Crescent North and Bakersfield St. The watermain crossing at Finch Avenue at Tangiers Road will use trenchless construction in order to reduce pedestrian and vehicular traffic impacts. The new watermain will terminate at Sheppard Ave. W. with possible future connections to new developments in the Downsview Area. Upgrades to the Keele Pumping Station are also recommended. The Project File has been placed on public record for a 30-day public review period starting November 2, 2017 and ending on December 2, 2017. Over the next decades, significant population growth is expected in the Downsview Area, including new development as part of the approved Downsview Area Secondary Plan. 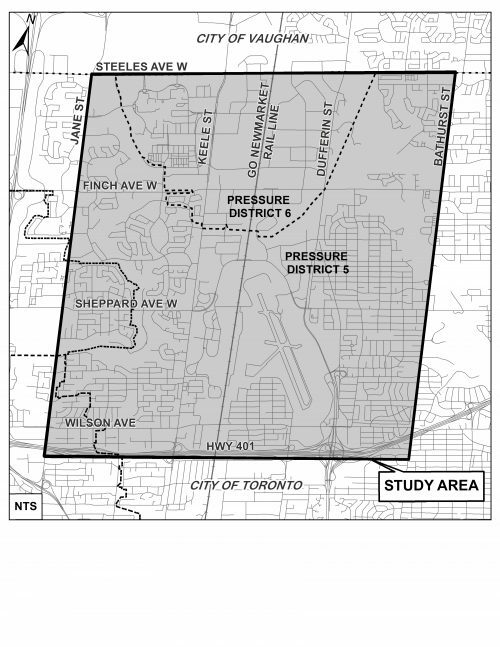 Previous studies prepared for the City identified the need for a new booster pumping station and transmission watermains to provide sustainable water servicing and water pressure in the Downsview Area. These studies also recommended that the City undertake a Municipal Class EA study to identify a preferred servicing solution and determine the preferred location for new facilities and preferred route for new watermains. The study is being planned as a Schedule “B” project under the Municipal Class Environmental Assessment (Class EA) document. The Class EA process provides members of the public and interested parties with opportunities to provide input at key stages of the study. The study will define the problem, develop and evaluate alternative solutions, identify preferred solutions, assess impacts of the preferred solutions, and identify measures to lessen any adverse impacts.